Getting the day started can be a challenge. So here are some suggestions to make your separation at the child care setting a little easier for both of you. 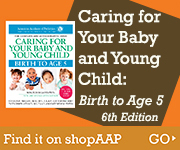 In early infancy your baby primarily needs love, comforting, and good basic care to satisfy his physical needs. Although this period may be a difficult time of separation for you, young infants generally will transition to a consistent child care worker in almost any setting. Be patient during this initial settling-in period. Stranger anxiety normally occurs at this time. Suddenly your baby may be reluctant to stay with anyone outside his family. The unfamiliar setting of a child care center also may upset him. If possible, do not start child care during this period, or just ease into it. If your child is already in a program, take a little extra time each day before you say good-bye. Create a short good-bye ritual, perhaps letting him hold a favorite stuffed animal. Say good-bye and then quietly leave. Above all, be consistent from day to day. This is when separation anxiety peaks and your child has the most difficulty with your leaving. He may not believe that you will return, and may weep and clip to you as you try to leave. Be understanding but firm and persistent. Reassure him that you will return when you're done with work or have finished your errands. Once you have left, do not reappear unless you are prepared to stay or walk with your child to the door.